The relatively new Crowley & Tripp range of ribbon microphones is produced by Soundwave Research Laboratories, based in Ashland, MA, USA, and named after the company's co-founders, Bob Crowley and Hugh Tripp. The Naked Eye mic is the fourth model to be launched, its elder siblings being the Proscenium, the Soundstage Image and the Studio Vocalist. All three are fundamentally the same mic, but with subtle tonal differences to optimise them for different ranges of sources. These three ribbon mics all cost in the region of £1000 in the UK, so the addition of a lower priced 'entry-level' model is most welcome. Ribbon mics are finally making something of a comeback, after they lost their role as one of the stalwarts of the recording studio back in the '50s and '60s. This is partly down to fashion, no doubt, but also the dawning realisation that cardioid capacitor mics aren't the only option, and that they are often not the most appropriate solution either. Most influential of all, though, is the growing number of affordable ribbon mics coming onto the market. Most are from the usual Eastern manufacturers, but some, like those from Royer, AEA and, indeed, Crowley & Tripp, come to our shores from the West — and I, for one, am very pleased with that! Soundwave Research Laboratories have an impressive background in the field of medical technology, and perhaps that explains the surprisingly high standards of machining and presentation found in this mic. The Naked Eye has a cylindrical body, roughly 40mm in diameter and 132mm long. The top third is given over to a strong multi-layer wire-mesh grille and a male XLR connector is built into the base. A coarse-threaded (but wonderfully smooth) collar around the XLR barrel can be removed to allow the supplied stand-mounting bracket to be fitted to the base of the mic, and securely held in place with the collar. The mic's serial number is written on a label hidden under this collar too. The stand adaptor is as well engineered as the mic. 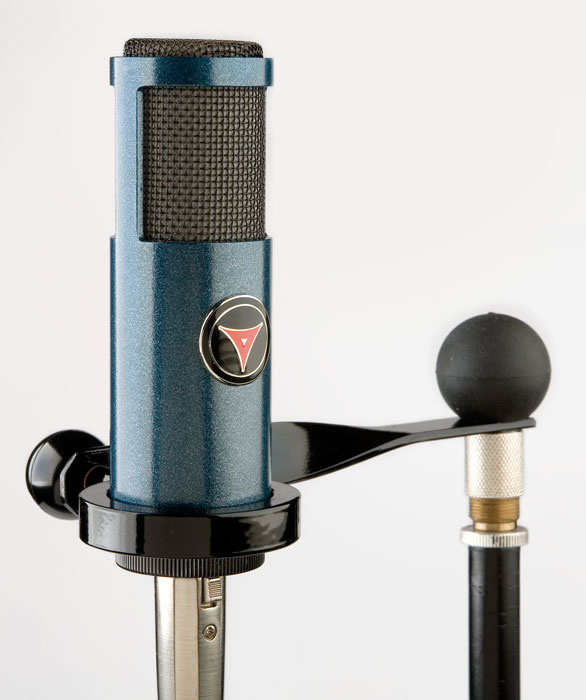 The mic sits in a felt-lined recess in a heavy metal disc, and a short rod, threaded at both ends, extends from the disc to a flat metal bar, which is secured with a threaded plastic ball. The angle between the bar and the mic can be altered simply by loosening the ball and re-tightening in the new position, while compliant washers between all the metal surfaces ensure a firm grip. The bar itself is twisted through 90 degrees so that the end that mounts on the mic stand is horizontal when the mic is vertical. A hole in the end of the bar allows the mic stand thread to pass through, and another threaded ball is provided to screw on to the top of the stand, clamping the bracket firmly in place. The technical specs for the mic state a nominal sensitivity of -51dB at 1kHz, but quite what the reference is I've no idea! The maximum SPL is given as 126dB and output impedance as 200Ω. Frequency response extends between 30Hz and 15kHz, but both ends of the spectrum fall away in that typical ribbon-mic way. The bottom end can be bolstered by close-miking to take advantage of the proximity effect, of course, while the top end has been cunningly tailored by the use of acoustic material in the grille. The front side of the Naked Eye has a typically smooth, classical ribbon sound with a gently falling top end that sounds flattering and warm, while the back of the mic (assuming that the side without the badge really is the rear) sounds relatively bright and more like a typical capacitor mic, but without the high-frequency resonances normally inherent in those designs. This feature is not unique to ribbon mics, but nonetheless it allows the user to choose the sound character best suited to the source. In effect, the front sounds similar to the Crowley & Tripp Proscenium mic, while the rear is more like the Studio Vocalist model — so you could look at the Naked Eye as two mics for around a quarter of the combined price of the larger models! Compared to ribbon mics of old, the Naked Eye does have quite a high output level — comparable to that of most dynamic mics, in fact — and has the inherently very low self-noise of all ribbon mics. It's not particularly fussy about preamps, but choose a good one and this mic will really let it shine! The polar pattern is obviously that typically well-defined figure-of-eight shape that ribbons do so well, with very little tonal coloration as you move off-axis. Of course, you can't move far off-axis before the sound level plummets, but in many applications that's a good thing. With thoughtful positioning, the very deep side nulls allow you to control and minimise spill to a surprising degree, even when recording an entire band in the same room. In this photo of the AEA R88 stereo ribbon mic, the all-important ribbon can be clearly seen through the walls of the mic body (click to enlarge).Ribbon microphones are actually a sub-set of the dynamic microphone family, in so far as they too work by magnetic induction. Instead of a coil attached to the diaphragm, however, the transducer consists of an extremely thin corrugated metal ribbon suspended between the poles of a magnet. Sound pressure displaces the ribbon within the magnetic field, inducing a proportional current in the ribbon, which is connected to the output. Ribbon mics offer a smooth, extended high-frequency response, but the ribbon needs to be suspended very loosely to generate good low-frequency pickup. It's this factor that makes ribbon mics more delicate than dynamics as, without good windshielding, the ribbon could potentially be damaged even by a blast of air. Output levels are traditionally quite low, requiring a step-up transformer to be used, but modern materials and manufacturing methods are now able to make ribbon mics that are sufficiently robust (and with higher output levels) even to be used on stage. Ribbon mics are inherently bi-directional, as the ribbon is open to sound from both front and rear (technically a 'pressure-gradient' transducer, responding to the difference between front and rear pressure), although other pickup patterns can be generated by shrouding one side of the ribbon. Unlike conventional dynamic mics, which can happily ignore phantom power even though they don't use it, a ribbon mic can actually be damaged by the inadvertent application of phantom power. The Naked Eye is a delight to use. The stand adaptor is brilliantly simple but effective, although a decent shockmount wouldn't go amiss, as it does pick up mechanical shocks rather too well. Similarly, you absolutely must use a pop screen, as even the slightest waft of breath anywhere near the mic will cause speaker-killing rumbles! Like most ribbon mics, it is also prone to stray magnetic fields, so keep it away from mains transformers if you don't want a constant hum on all your recordings! Obviously, this isn't likely to be a problem if you're recording vocalists or acoustic instruments, but can often become an issue when close-miking electric guitar combos. I also once had a problem using a pair of ribbon mics as drum overheads. One mic was fine but the other hummed. A replacement mic hummed in an identical way, as did the previously quiet mic which I swapped from the other side of the drum kit! It turned out that there were some fluorescent lighting chokes in the ceiling void just above the problem mic. D'oh! The proximity effect is fairly mild once you get more than about six inches away from the mic, but closer miking provides that characteristic larger-than-life sound that can really lift a good voice. The bright side of the pattern isn't fierce or harsh in any way, but gives a nice presence to the sound that really helps it to cut through a mix, while the darker side is just that — smooth, warm and mellow in a way that seems purpose-designed for electric guitar cabs. The side nulls are deep and clean, and I was able to produce a remarkably spill-free acoustic guitar track from a singing guitarist just by carefully aiming the side null at the player's mouth while pointing the axis of the mic at the twelfth fret. I wish I'd had two Naked Eye mics to hand, because I could have done the same trick to keep most of the guitar out of the vocal track too! There are cheaper ribbon mics around and there are more expensive ribbon mics around, but the Naked Eye seems to offer a very nice balance of build quality and sound quality. While no ribbon is as robust as a moving-coil mic, the Naked Eye does seem to be relatively rugged, and it comes with a three-year warranty, which is even more reassuring. This is definitely one to audition if you're in the market for a very nice, versatile ribbon mic. But you can't have this one — it's staying here! Anyone who thinks microphone technology peaked 30 years ago might be interested to learn that Soundwave Research Laboratories have applied for several patents for various "discoveries and inventions in the fields of ribbon and thin-film sound devices". These technologies include the "carbon nanotube ribbon microphone". Nanotubes are miniature cylinders of carbon that can be used to make very high strength but lightweight conductive diaphragms, claimed to result in significant improvements in the consistency, purity and quality of the output signal. Apparently, we should expect this technology to appear in a studio mic within the next few years, but in the meantime it is being applied to intravascular ultrasound equipment for finding blockages inside human blood vessels! These days there are several alternative and affordable ribbon microphones. A long-time favourite and classic is the Coles 4038, which costs about 15 percent more than the Naked Eye, and the similarly priced AEA R92 is another strong contender. The latter shares the Naked Eye's useful dual tonalities, with a brighter sound on one side than the other. Another option is the SE Electronics ribbon mic (which will be reviewed in a forthcoming issue of SOS). Stepping up a level in price are the newer Coles 4040 and the Royer R121, both at about £760 and both very nice microphones indeed. At the lower end of the price scale are mics such as the Sontronics Sigma and the Oktava ML52. To a large degree, you get what you pay for in ribbon mics, but all share the same fundamental qualities that set the ribbon apart from the condenser mic. Higher priced models tend to be better built, with a more delicate and detailed sound, and less susceptibility to external magnetic fields. Excellent sound quality for a very reasonable price. Different pickup characteristics at the front and back make this a versatile mic. High output and low self-noise. Figure-of-eight pickup pattern allows for creative mic placement. A shockmount may be necessary in some situations. Like all ribbon mics, it's susceptible to magnetic interference from mains transformers. This mic's combination of classy sounds, excellent build quality and value for money should encourage more people to join the ribbon revolution!